Stuart Spencer believes Harborough Town’s credentials will receive an “acid test” in their next two games. and are unbeaten in six matches, winning their last three. Star last weekend as, after trailing 1-0, Ben Williams and Barnes Gladman grabbed last-gasp goals to secure a 2-1 success. That came on the back of eye-catching successes against Daventry Town and Yaxley. But the tough tests keep coming for Harborough as they gear up for back-to-back home games against Deeping Rangers on Saturday and current leaders Leicester Nirvana next Tuesday night. “It was a late win last weekend but since I have been appointed it was probably our worst performance if I am being brutally honest,” Spencer said. “We rode our luck in the first half but I will give the lads credit because they stuck at it right until the end and we managed to get over the line. 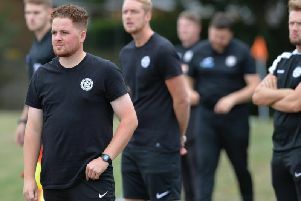 “In the games against Yaxley and Daventry Town we deserved what we got against two good teams and that’s what we will need to do in the next two. Another big weekend lies ahead for Lutterworth Athletic and Lutterworth Town in Division One of the UCL. Athletic moved up to sixth place last Saturday after they saw off Bugbrooke 3-1 at Hall Park. Craig Maisiri scored twice and Danny Page added the other to keep Athletic firmly in the mix at the sharp end of the table. And it is a big game for them on Saturday as they host Olney Town, who currently sit in fourth place and just a point ahead of Athletic. It was a good day for Lutterworth Town last Saturday as well as they enjoyed a 2-0 home success over Huntingdon Town. The Swifts are on the road this weekend when they head to Long Buckby.